Ever since creating my Oatmeal Almond Banana Pancakes, I've toyed around with the idea of doing something similar in a bread. This weekend I finally did! Today's recipe, however, isn't an indulgence. 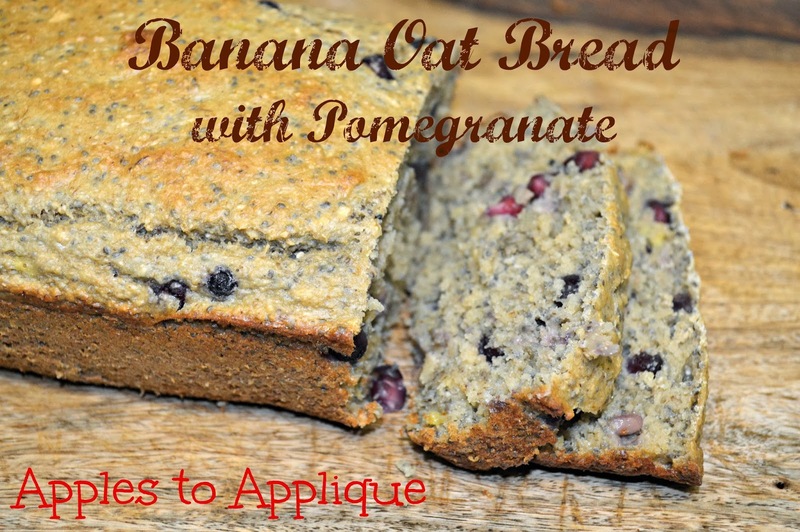 It's a tasty breakfast bread that's packed with nutrients and none of the bad stuff. It contains no refined sugars or flours, and can be made gluten-free. (If you're looking for a breakfast bread that is more of an indulgence, try my Cranberry Orange Bread). If fresh pomegranates aren't in season, try substituting blueberries or cranberries or some other type of fruit. Fresh or frozen berries should work fine in this recipe. 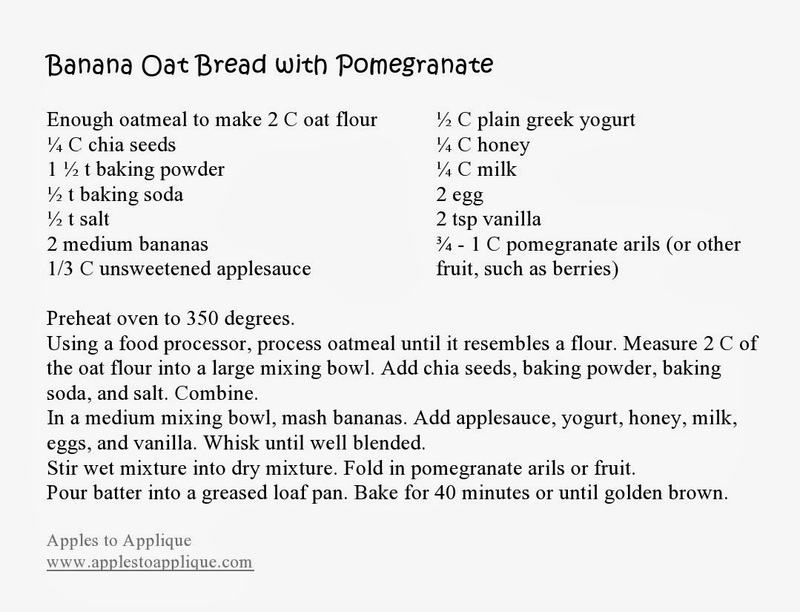 *If you want to make this gluten-free, be sure to purchase gluten-free oats, baking powder, and baking soda. Use a food processor to grind the oatmeal into oat flour. Measure 2 cups of the oat flour into a large mixing bowl. Add the baking powder, baking soda, chia seeds, and salt. Combine. In a medium mixing bowl, mash the bananas. I like to use a pastry blender for this job, but you can use a fork, too. Add applesauce, yogurt, honey, milk, eggs, and vanilla to the bananas. Whisk until well combined. Stir wet mixture into flour mixture and mix well. Fold in pomegranate arils or berries. Bake for 40 minutes, or until bread is golden brown. Cut yourself a hearty slice and enjoy your guilt-free breakfast! Right click image below to download a printable version of the recipe. Hi, it's Michael from Foodie Friday. Thank you so much for participating. Your blog is a delight! Thanks Michael! I love your blog, too, and am excited to continue participating in Foodie Friday! I was also intimidated by pomegranates until I found a tutorial on Pinterest that explained how to use them. It worked well! Thanks for stopping by!